The present book addresses a significant gap in our collective knowledge on biobanking advancement through public-private partnerships. These partnerships are often alluded to in the peer-reviewed literature however one remains hard pressed to find and review a convincing, consistent body of evidence. The book moves quickly and effectively beyond a descriptive listing of the current landscape and sets as its core quest the aim of improvement. This improvement is multi-faceted: it can involve amongst others individual biobanks, collaborative projects, reference/national centers, qualitative standards, Intellectual Property (IP) issues, rights and obligations of stakeholders; all brought together for the common purpose of public and private benefit. Over the past two decades the biobanking field has enjoyed a period of sustained investment, growth, wider scientific acceptance and development. Additionally, individual biobanks have benefited by support from very active, scientific community-driven societies, such as ISBER, the International Society for Biological and Environmental Repositories, and others. This has created a strong foundation for the regular exchange of experiences, the development of best practices and creation of educational tools with a global reach, especially as the biobanking field develops in Asia, Africa and south America. However, as the global financial crisis has developed into an enduring pressure for tighter cost control, expense justification and even cost retrieval, new operational models need to be considered for long-term sustainability in biobanking. This book investigates these alternative approaches which can operate in collaboration with the private sector yet without limiting their public benefit. The editors have selected six distinct perspectives to provide a holistic approach in their subject. These are: Current practices; Quality management systems; Specimens quality; Rights and obligations of stakeholders; Collaboration models and Case studies. Sub-themes include the complementation and conflicts of different sectors and skill sets; the accreditation options and processes; the inherent trust in sample acquisition and processing, including biosafety. At the same time legal frameworks, different collaboration models and case studies are being brought together as a living corpus of evidence. It is indeed a very good collection of workable examples presented by some of the most respected scientific leaders in the field. This book is an impressive and comprehensive study that moves beyond stereotypes that the biobanking field has often faced. It analyses why partnerships work and the future aspects that still need to be explored. Within the ISBER community there is the acute realization that private partners, commonly from the pharmaceutical industry, are often an essential component in addressing complex, healthcare related questions effectively and efficiently. The public –private partnerships have the potential to form a long-term, reliable infrastructure network enabling the discovery of new pharmaceutical agents, effective re-purposing of existing ones and preparedness in global health emergencies. I sincerely hope that more such examples will develop and strengthen in years to come, allaying public hesitation, and that a similar body of evidence will be developed in the not too distant future from our colleagues in Asia, Africa and south America. When walking the long way in the development of new products and methods to be used for patient treatment or diagnosis, medical translational research needs to be able to exchange knowledge and biomaterials in the public-private domain. Collaboration in this area is often indispensable for the final innovation of patient care. Funding institutions understand this need and increasingly try to stimulate this important domain where many exciting and interesting opportunities can be found. At the same time, it is also a difficult area to work with biomaterials as it means yet another boundary where you need to learn to deal with new often stricter rules with respect to ethics and regulatory issues. Yet this is certainly not the only aspect important for a smooth cooperation, also the quality of the samples are very crucial. Especially where reproducibility is concerned which can be a show stopper easily and unexpectedly encountered. Certainly the moment after the research process where a developed method or product needs to be validated for its intended use. In this step, one has to rely on the quality of the routine diagnostic samples which might be collected under very different pre-analytical conditions as the samples that were used in the discovery phase. The infrastructure of the biobank becomes very important. It should reflect or better yet make use of the existing routine diagnostic pathways. In addition, the quality of the diagnostic sample is in need for improvement to facilitate new products and methods more efficiently. Concrete examples of public-private collaborations based on local infrastracture synergies. This logical line is also chosen to set up the book to become a consistent and structured overview of the complex domain of public private partnership. It consists of six interesting chapters, where each chapter starts with an abstract of the content. The field is an exciting and dynamic one with many opportunities for scientists from the academic setting and companies to find common grounds to synergistically grow in win-win environments. The reflection on collaboration between public and private institutions in biobanking is crucial for making advances in this field. Precision Medicine (PM), digitization and virtualization are quickly changing the biobanking landscape by asking for new models and concepts of synergies between public and private (or for profit) organizations. However, this theme is currently under-analysis both in the literature and in scientific debates. The need for developing or improving collaborations between public and private institutions is recognized by several scholars but it still remains a niche topic in biobanking. Furthermore, the reasons for developing public-private synergies (also called partnerships) are usually connected to biobank sustainability, on the public side, and to the acquisition of academic know how, on the private side. This interpretation of the public-private-partnership (PPP) in biobanking seems to simplify the complexity of the issues related to public and private collaborations. It also seems to reduce the huge potentiality of promoting public-private synergies for biobanking advances and the related benefits for both public and private organizations working in this field. Taking the above discussion into consideration, this ebook analyzes perspectives, methods and concrete ways to change the current models of collaboration between public and private organizations in order to improve biobanking practices. The first chapter (Morente and colleagues) describes the state-of-the-art of public-private collaborations in biobanking on a global scale and it defines potential ways to improve these synergies. By highlighting that “the promotion of health” unconditionally should be the final goal of any partnership between public and private organization, Morente et al., list several criteria to reconsider the current theories of PPP in biobanking. 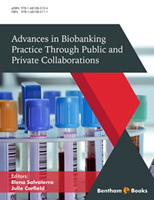 Innovative approaches to public-private collaborationsin biobanking are suggested by Lawlor and colleagues (chapter two). After an extensive analysis of “old” and current strategies of liaison in this realm, Lawlor et al., recommend concrete models and methods of PPP to improve the biobanking practice. The quality management system as a key aspect for public-private synergies in biobanking is the subject of chapter three. Bravo and colleagues extensively analyze the work of the technical committee “ISO T C 276 biotechnology” related to biotechnology standardization by focusing on biobanks and bioresources. The authors give a clear explanation of the role of ISO biotechnology standards to improve the quality of services for biobanks and to offer access to new markets for industries. The description of quality standard criteria specifically tailored for tumor biobanks is provided by Bonizzi et al., (chapter four). The authors report the standard requirements to be followed for processing samples and data in daily practice. These criteria are not different for public or private “partners”. High level of quality is demanded by each organization for using the samples stored in the biobanks, regardless of the public or private nature of the inquiring institutions. The access conditions to biobanks is the theme analyzed in chapter five by Verlinden and colleagues. After a deep analysis of the general legal framework governing biobanks at national (Belgium), European and international levels, Verlinden et al., consider the access conditions to human biological samples and associated information. Access conditions to samples and information stored in biobanks within the concrete model of the “HUB-BTB- 3CR” is the subject of chapter six. Di Donato et al., describe the HUB-BTB- 3CR which is a centralized organization for managing sample requests. This model enables public and private researchers to directly access the biobanks which are part of the hub. Although tailored for organizations operating in France, this prototype of public-private collaborations could be used in other countries with modifications as per requirements. Moving from the theory to the practice, this ebook suggests an accessible analysis of the main issues related to public-private partnerships in biobanking. It considers apparently conflicting concepts, such as academia, industry, profit and solidarity illustrating that they are not necessarily in contrast when trust, transparency and reciprocity are the basis of public-private collaborations in biobanking. Coordinator Scientific Projects and Regulatory Affairs, Exem Italia s.r.l.